Achievements: Became President of Indian National Congress in 1959; was Minister of Information and Broadcasting in Lal Bahadur Shastri's government; became Prime Minister in 1966; nationalized major banks in 1969; gave the slogan of Garibi Hatao during 1971 general elections; led India to a decisive war against Pakistan in 1971. 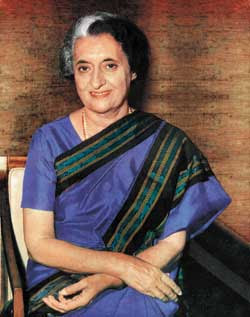 Indira Gandhi, one of the best-known women of the 20th century, was Prime Minister of India, and daughter of former Prime Minister Jawaharlal Nehru. Also known as Indira Nehru Gandhi, she was born on November 19, 1917 in Allahabad. She was born in a family that was at the centre of Indian freedom movement. Her father Jawaharlal Nehru and grandfather Motilal Nehru were at the forefront of Indian freedom struggle. Her mother Kamla Nehru, although less involved politically, was subject to political arrest by the British. Indira Gandhi had a lonely childhood, with some of her most vivid remembrances being the entry into her home of British policemen. As her parents did not want to send her to any of the British schools in India, Indira Gandhi's education took place at a series of Indian schools and at non-British schools in Europe, with a number of private tutorials interspersed between periods at school. Indira Gandhi married a Parsi named Feroze Gandhi in 1942. The marriage was opposed by orthodox Hindus because it was an intercommunal love marriage not arranged by her parents. Jawaharlal Nehru too opposed the marriage on grounds that the couple were somewhat incompatible because both possessed fiery tempers. Publicly, however, both Jawaharlal Nehru and Mahatma Gandhi strenuously defended the marriage. Shortly after their marriage both Indira Gandhi and Feroze Gandhi were arrested and jailed for nationalist activities. Indira Gandhi was released after eight months and Feroze Gandhi after an year. After the release Feroze Gandhi became editor of The National Herald, a newspaper founded by Jawaharlal Nehru, and Mrs. Indira Gandhi became the principal confidant and assistant of her father during the period of Nehru's prime ministership (1947-1965). The couple separated for a number of years during the 1950s as Feroze Gandhi launched his own political career in Parliament and was often at odds with Jawaharlal Nehru's policies and style. In 1959 Indira Gandhi became President of the Indian National Congress and in 1964 she was elected to the parliament. Meanwhile, the death of Feroze Gandhi (from a heart attack) in 1960, and the subsequent death of her father in 1964, caused Indira Gandhi to withdraw into a shell and limit herself to her immediate family. After the death of Jawaharlal Nehru, Lal Bahadur Shastri became Prime Minister and Indira Gandhi was the minister of Information and Broadcasting in his government. After Lal Bahadur Shastri's untimely death in 1966, she was selected as prime minister by party bosses within the Congress Party as a compromise candidate. Her candidature was opposed by Morarji Desai, a veteran nationalist and prime ministerial aspirant himself. The Congress bosses were apparently looking for a leading figure acceptable to the masses, who could not only command general support during the next general election but who would also acquiesce to their guidance. In her initial days as Prime Minister, Indira Gandhi encountered numerous problems such as Mizo tribal uprisings in the northeast; famine, labour unrest,and misery among the poor in the wake of rupee devaluation; and agitation in Punjab for linguistic and religious separatism. In the fourth general elections held in 1967, Congress suffered a major setback. Congress majority was greatly reduced in parliament and non-Congress ministries were established in Bihar, Kerala, Orissa, Madras, Punjab, and West Bengal. This forced Mrs. Indira Gandhi to become assertive and opt for a series of choices that pitted her directly against the Congress Party high command, which had previously been built up by her father. Seeking to eradicate poverty, Mrs. Gandhi pursued a vigorous policy in 1969 of land reform and placed a ceiling on personal income, private property, and corporate profits. She also nationalized the major banks, a bold step amidst a growing rift between herself and the party elders. The Congress expelled her for "indiscipline" on November 12, 1969, an action that split the party into two factions: the Congress (O)-for Organisation-led by Morarji Desai, and the Congress (I)--for Indira-led by Indira Gandhi. Indira Gandhi campaigned fiercely on the slogan of "Garibi Hatao" (eliminate poverty) during the fifth general elections in March 1971 and won an unprecedented two-third majority. Her leadership qualities came to the fore during India-Pakistan war in 1971 that resulted in liberation of Bangladesh. India achieved decisive victory over Pakistan in the face of diplomatic opposition from both China and the United States and a lack of international support from almost every other nation except the Soviet Union and the Eastern Bloc countries. Indian victory over Pakistan led to a great surge in Indira Gandhi's popularity and she was compared to Goddess Durga by ordinary Indians. Expectations raised by the garibi hatao campaign and India's victory over Pakistan in 1971 led to great disappointment and political difficulties in the mid-1970s. Enormous economic cost of 1971 war, increase in world oil prices and, drop in industrial output added to the economic hardships. During this time J.P.Narayan initiated a civil disobedience movement against Indira Gandhi. In June 1975, amidst all this crises Allahabad High Court invalidated her 1971 election on the grounds of electoral malpractices. Instead of resigning, Indira Gandhi declared an Emergency in the country and jailed al her political opponents. The Emergency lasted till March 1977 and in the general election held afterwards she was defeated by a coalition of parties called Janta Morcha. Factionalism among coalition partners led to the collapse of Janta government and Indira Gandhi came back to the power once again in 1980. But her second innings was beset with difficulties and personal tragedies. Her younger son Sanjay Gandhi died in an air crash. Her government was confronted with serious challenges to its ability to maintain law and order as conflicts between religious and ethnic groups broke out in different parts of the country. After the army had invaded the Golden Temple in Amritsar, the chief shrine of the Sikhs, which had been held as an armed camp by a group of militant Sikhs, she became the target for Sikh anger and on 31 October 1984 she was assassinated by her own Sikh bodyguard.